Like a spirited idea exchange among experienced professors, Teaching Tips: Innovations in Undergraduate Science Instruction brings you the best thinking from campuses nationwide about how to engage undergraduate science students. 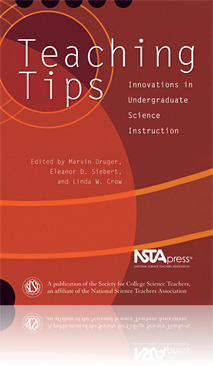 Published to commemorate the 25th anniversary of the founding of the Society for College Science Teachers (SCST), Tips is a quick-read compilation of more than 50 innovative approaches that SCST members have found especially effective. Most of the ideas in the book are applicable across the sciences. Because the tips are only 500 to 700 words each, all contributors have provided contact information so you can learn more by e-mailing them directly.